Hariolf Schlichtig at the Hochschule für Musik und Theater in Munich and in the seoson of 14/15 at the Hochschule für Musik in Lübeck with Professor Heime Müller, former member of the Artemis Quartet. Since June 2015, the Belcea Quartet has been the mentor of the Novus String Quartet. The quartet is part of the Belcea Quartet Trust Coaching Scheme. 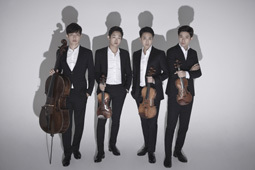 Their first CD (Novus Quartet #1) was released at the French Label Aparté in Spring 2016, presenting works from Beethoven, Webern and the rarely played Korean composer Isang Yun. The 2nd recording including Tchaikovsky’s 1st string quartet as well as the sextet “Souvenir de Florence” was released in Autumn 2017. The spring 2019 will see the release of the third recording of the string quartet with Berg’s Lyric Suite and Schubert’s quartet “Death and the Maiden”.